Elizabeth Diffey describes herself as ‘a dry humored, podcast listening, pastel loving, alignment obsessed, London born, Brooklyn based designer’. 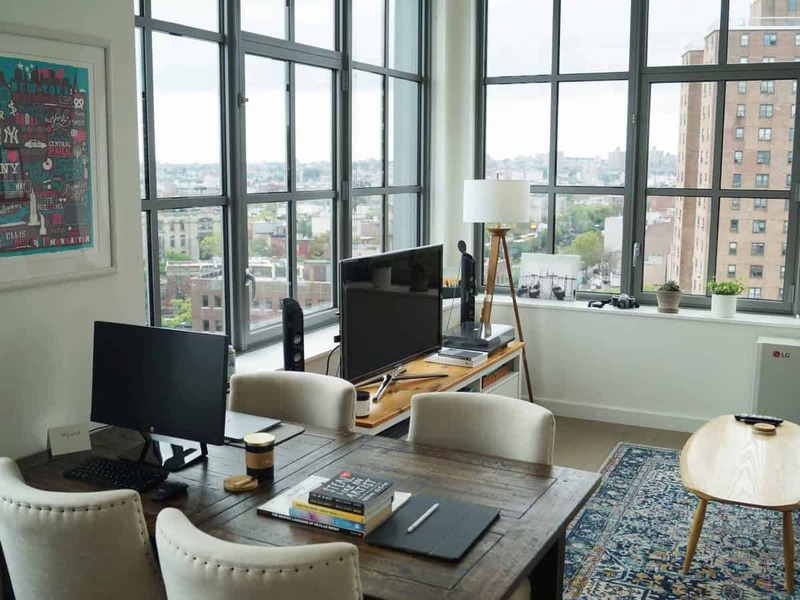 Elizabeth shares some photos of her Brooklyn apartment which also doubles as her creative workspace. Like most NYC apartments, I don’t have much room for a desk so I work from my dining table. 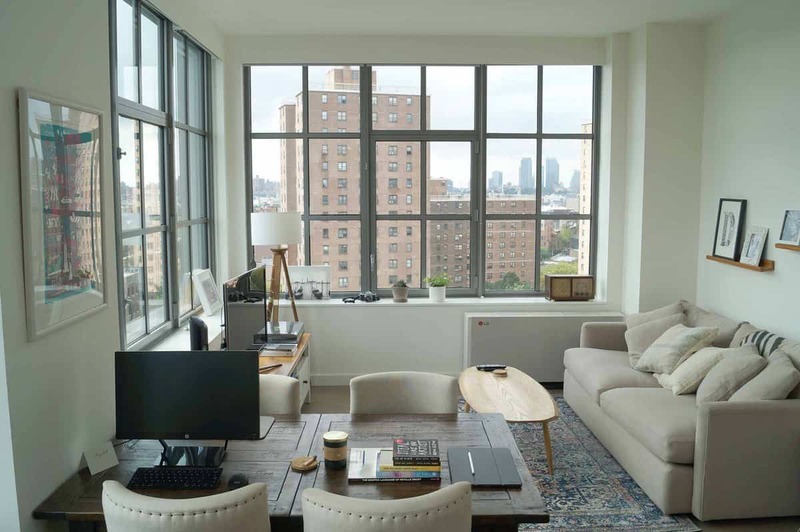 Luckily, I have a great view of Brooklyn to enjoy, so the limited space is easily forgotten. I love to stare out of the window and watch people go about their lives while I am cooped up inside! I am slowly expanding the equipment I use but at the moment I have a Macbook Pro 13” retina display with touch bar, which I love but wouldn’t recommend the touch bar, I found it to be more of a nuisance than help. I also have a 12” iPad Pro which I use to present my portfolio in interviews, and to sketch on with my apple pencil (which I am obsessed with). This is accompanied by an array of cheaper non-Apple product accessories such as my HP screen and Canon printer, all bought from Amazon. One day, I would like to extend my abilities to motion graphics so I will splurge on an iMac Pro but in the meantime my current setup works for me. I listen to a lot of podcasts and music while working. My favourite creative podcasts are Overshare from the founder of Working Not Working Justin Gignac and Design Matters with Debbie Millman. I enjoy hearing the stories of successful creative’s, particularly learning about their process and how they overcame obstacles. It helps put everything in perspective and reminds me that even the greatest designers are just normal people! When I am not listening to podcasts I usually listen to the radio (WFUV, Radio 6 or RadioX) or bands like Royal Blood and LCD Soundsystem. 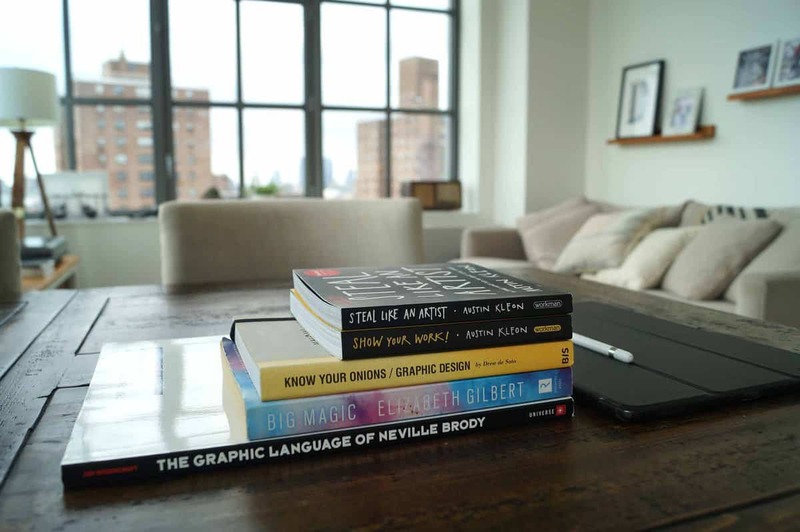 I decided to make the switch from sales to graphic design about a year ago and to help me with that transition I bought numerous creative self help/inspirational books. 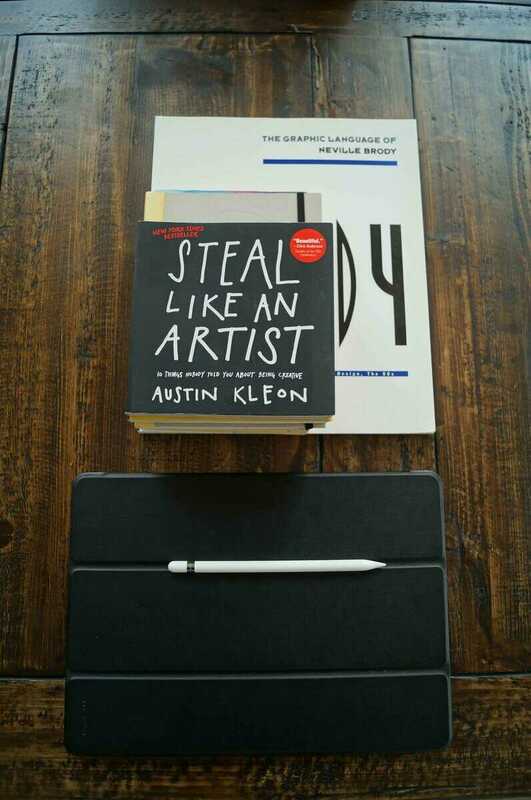 The first books I read really resonated with me, they are part of a series written by artist/writer Austin Kleon and are called Steal Like an Artist and Show Your Work. They are quick reads which easily inspire without demanding too much time from the reader, they really cut to the chase and encourage the reader to drop inhibitions and put themselves out there. I also love Elizabeth Gilbert’s (who also wrote Eat, Pray, Love) last book Big Magic, which also teaches that we should share our work without worrying what people think, because the majority of time people are too concerned with themselves to think that much about what you have done. Gaining that realisation is really liberating. My apartment is usually pretty messy, from mine and my husbands busy schedule and hatred of house chores. So these pictures are a “best case scenario” but if you could see what was out of shot then you’d see how much stuff is just lying around. However when it comes to where I work I have to keep it clear. I’ve always been one of those people that neatens up their desk before leaving the office and I am the same at home. Clear desk, clear mind. 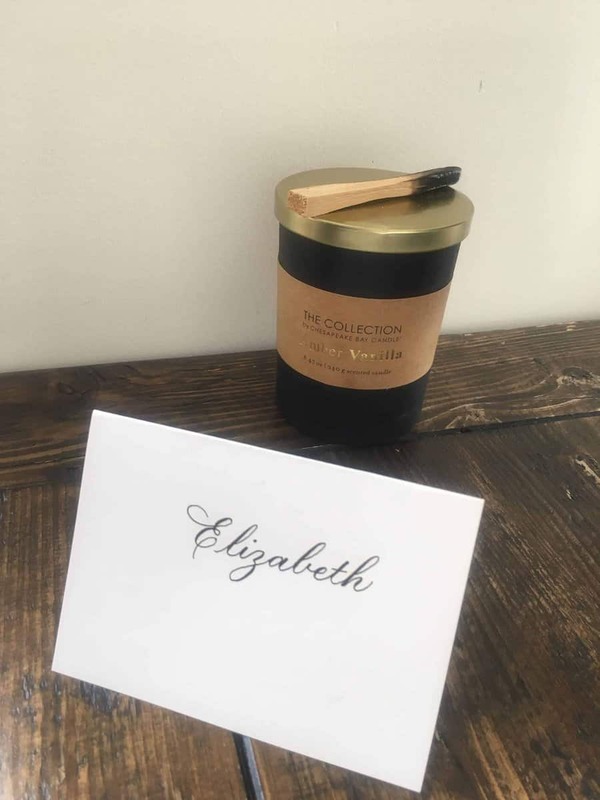 That being said, I have a place setting card that sits on my desk, it has my name on it that I got from a Calligraphy lesson with Doris Fullgrabe. I also keep a candle and a stick of Palo Santo nearby. Palo Santo is supposed to cleanse the air, but I just love the woody smell. For a long time I also had my CV pinned to the wall next to where I sit, a tip I learned from The Design Kids online course “Pimp your Graphic Design career”, which recommends that you print out and pin your CV somewhere visible so you are always thinking about how to improve it and gain more experience. I took it down recently before I had some friends over, I didn’t want it to be a topic of conversation!